Hello, everyone, and welcome to the Rev Up. With two rounds remaining in the 2012 Lucas Oil Pro Motocross Championships, expect the intensity to become even higher. In the 250 Class, Blake Baggett has a comfortable lead and can afford to ride conservative to the series title. Ah, but being conservative can be a slippery slope. A freak mechanical, or a crash could put “Bad” Blake right back in the hornet’s nest. The ferocity of Justin Barcia and the speed of Eli Tomac snapping at his heels is a situation he doesn’t want to know. That said, I’d expect more of the same from Baggett; heroic rides to the front and most likely an overall win. He has the stuff right now and it has been his series since Hangtown. This is why we run the races though, folks. Also, it is a shame that hometown boy Darryn Durham isn’t racing because he is an absolute beast at this place. Steel City Raceway in Delmont, PA is the scene for this Saturday afternoon’s dust up. The weatherman says sunny and mid 80’s so we should be in store for another pearl. Steel City has some parallels to her sister track High Point in that it sits in a green grass valley with a ton of elevation change and off camber corners. Two of the most poignant areas of the track are the staircase sections, and the uphill start which bends to the left then drifts off downhill. Also a parallel to High Point, the start here can produce a holeshot from almost anywhere and is far from devoid of mayhem. In addition, this course is far from one-lined. Loaded with inside/outside options a racer can make moves by charging the downhills and setting up his target. I’ve seen some amazing battles here, like Grant Langston vs. Kevin Windham, and last year’s instant classic between Ryan Villopoto and Ryan Dungey. 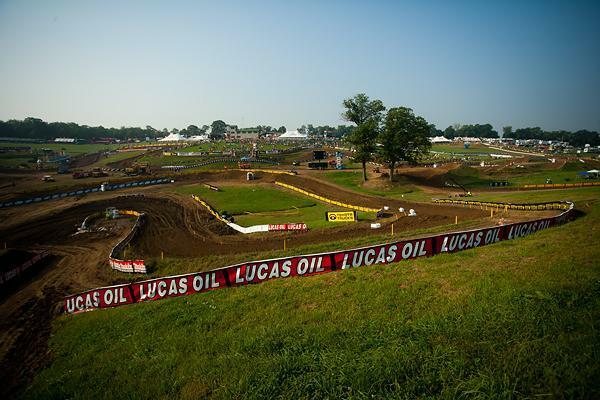 Steel City will play host to round 11 of the 2012 Lucas Oil Pro Motocross Championship. The 250 Class has been hyper all summer, and they’ll be going nuts as we chase down the championship. Look for the KTM duo of Ken Roczen and Marvin Musquin to build on the momentum of their historic weekend at Unadilla. KRoc is still sans O/A, a stat he wants to drop. He’ll be salty on the dynamic Steel City design. We haven’t seen the speed of rookie Jeremy Martin yet either. He’s wounded, but a holeshot is the ultimate morphine. While newly crowned champion Ryan Dungey will likely dominate the 450s, I’d look for the surging Broc Tickle and the ever present Mike Alessi to chase him hard. Podium bonuses are very real and with only two more chances to make some cake, look for guys like Davi Millsaps, Andrew Short, Josh Grant and Nico Izzi to race with extra verve down the stretch. Also train an eye to privateer Phil Nicoletti to contend for a top five in one of the 450 motos. It’s going to be another badass display of motocross! Steel City has a rowdy fan contingent and it should just be warm enough to see some skin from the females. Time to run again, son!